↑ Garrity GM, Bell JA, Lilburn T (2005). "Class I. Alphaproteobacteria class. nov.". प्रकाशित Brenner DJ, Krieg NR, Staley JT, Garrity GM. Bergey's Manual of Systematic Bacteriology Volume 2: The Proteobacteria Part C (The Alpha-, Beta-, Delta- and Epsilonproteobacteria (2nd संस्करण). Springer. पृ॰ 1. डीओआइ:10.1002/9781118960608.cbm00041. ↑ अ आ Boden R, Hutt LP, Rae AW (2017). "Reclassification of Thiobacillus aquaesulis (Wood & Kelly, 1995) as Annwoodia aquaesulis gen. nov., comb. nov., transfer of Thiobacillus (Beijerinck, 1904) from the Hydrogenophilales to the Nitrosomonadales, proposal of Hydrogenophilalia class. nov. within the "Proteobacteria", and four new families within the orders Nitrosomonadales and Rhodocyclales". International Journal of Systematic and Evolutionary Microbiology. 67: 1191–1205. डीओआइ:10.1099/ijsem.0.001927. ↑ अ आ Williams KP, Kelly DP (2013). "Proposal for a new class within the phylum Proteobacteria, Acidithiobacillia classis nov., with the type order Acidithiobacillales, and emended description of the class Gammaproteobacteria". International Journal of Systematic and Evolutionary Microbiology. 63: 2901–2906. डीओआइ:10.1099/ijs.0.049270-0. ↑ Kuever J, Rainey FA, Widdel F (2005). "Class IV. Deltaproteobacteria class. nov.". प्रकाशित Brenner DJ, Krieg NR, Staley JT, Garrity GM. Bergey's Manual of Systematic Bacteriology Volume 2: The Proteobacteria Part C (The Alpha-, Beta-, Delta- and Epsilonproteobacteria (2nd संस्करण). Springer. पृ॰ 922. डीओआइ:10.1002/9781118960608.cbm00043. ↑ Garrity GM, Bell JA, Lilburn T (2005). "Class V. Epsilonproteobacteria class. nov.". प्रकाशित Brenner DJ, Krieg NR, Staley JT, Garrity GM. Bergey's Manual of Systematic Bacteriology Volume 2: The Proteobacteria Part C (The Alpha-, Beta-, Delta- and Epsilonproteobacteria (2nd संस्करण). Springer. पृ॰ 1145. डीओआइ:10.1002/9781118960608.cbm00044. ↑ Woese, CR (1987). 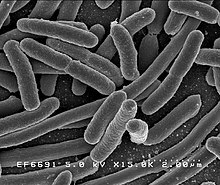 "Bacterial evolution". Microbiological Reviews. 51 (2): 221–71. PMC 373105. PMID 2439888.